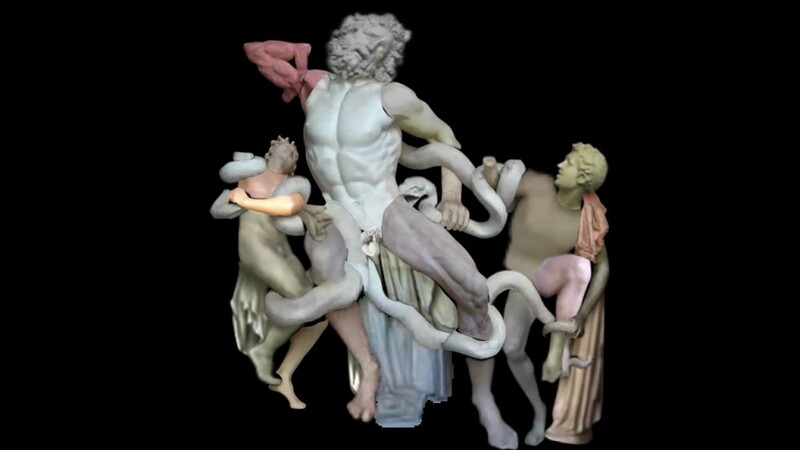 With Outthrust Arm uses tourist-shot footage of the famed sculpture from antiquity, Laocoön and His Sons. This canonical work from Western art history is on permanent display in the Vatican Museum. Found on the Internet, these videos are collaged and combined to create a single-channel work. By cobbling together these varied sources, the piece reconstructs the iconic sculpture based upon the accumulated experiences of the general public. Through a technique of frame-by-frame masking – digitally cutting out a portion of a moving image frame from its background – one fragment is isolated from every found clip and the sculpture is broken into virtual pieces. Each segment is animated by the shaking handheld movements of its camera operator. The motion of these images has been minimally manipulated, so that the presence of the person filming remains. The segments of the statue combine and recombine, the disconnected parts searching for their proper position. This process of assembly and disassembly is deliberately apparent, left in an unpolished state. In so doing, the reconfiguring and revisioning of artworks, experience, and history are made visible and manifest. Anna Hawkins (US) is an artist working primarily with video. After receiving a BA in Art History from the University of Pittsburgh, Hawkins now resides in Montreal, QC where she completed an MFA at Concordia University. Her most recent works employ genres and examples from art history and current internet culture as a framework through which to sift, collect, and collage online-sourced and original images. She has exhibited her work as a part of the UCLA New Wight Biennial in Los Angeles, as well as at the AC institute in New York, the Struts Gallery & Faucet Media Arts Center in Sackville, New Brunswick, and at InterAccess in Toronto.